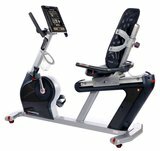 Pros The Schwinn 270 Recumbent Bike features 29 different workout programs, 25 levels of resistance, and a USB port for electronic devices so the user can listen to music or watch videos during the workout. The seat is fully adjustable, wide and comfortable. Cons The bike weighs 101 pounds (46 kg), which means most users will need to find a permanent spot for it. 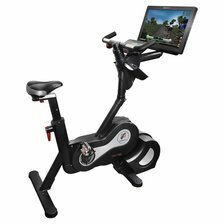 Summary The Schwinn 270 has features comparable to those found on recumbent bikes in gyms, and its numerous workout programs and fitness tracking metrics help provide variety and motivation. Pros The Expresso HD Bike has an HD video screen to simulate over 40 different rides over varying terrain and in different seasons. Riders can compete with each other, against their own best times, or against the computer. Cons The Expresso HD weighs 155 pounds (70 kg), so it's not a portable machine. The luxury price tag may be cost-prohibitive for many potential buyers, also. Summary Users say the bike is like a video game and fitness routine, all in one unit. Its cost makes it a big-ticket fitness investment, but users do say the variety of workouts helps keep them interested in making their fitness goals. 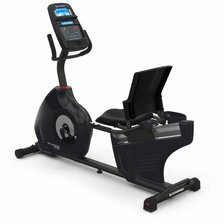 Pros With 32 levels of resistance, and 35 different workout programs, the Diamondback Fitness 910SR Recumbent Bike has features not usually found on home exercise bikes. It is sturdy and stable, and the seat adjusts to fit a wide range of heights. Cons At a hefty 152 pounds (69 kg), this bike will stay where it is assembled. Users say assembly is fairly straightforward, but will take a couple of hours. Some users also report issues with warranty repairs. Summary The Diamondback Fitness 910SR is a well-built bike, with numerous features, and is equally as good for the serious fitness enthusiast as it is for the casual biker. Users do need to consider whether they have sufficient space for this machine, however. 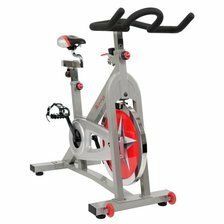 Pros The Sunny Health Fitness Pro Bike is geared toward performance. The tension in the flywheel is variable and works with a braking system. It's a durable, sturdy bike. Cons The bike has a chain drive, and some users found it to be noisy. The seat also may not adjust low enough for shorter users. The bike also weighs 108 pounds (49 kg), meaning most users will not want to move it around too often. Summary The Sunny Health &amp; Fitness Pro bike will support riders up to 275 pounds (125 kg) and is great for users needing a serious workout, or to help them maintain a workout routine. Pros With its sleek appearance and durability, the Exerpeutic Bike is packed with features and folds up for easy storage, even in small spaces. Cons Some assembly is required, but buyers report the process is easy and should not present a problem. Summary With its many features, easy storage and assembly, as well as durability, the Exerpeutic Folding Magnetic Upright Bike is a great buy to help users achieve their fitness goals.